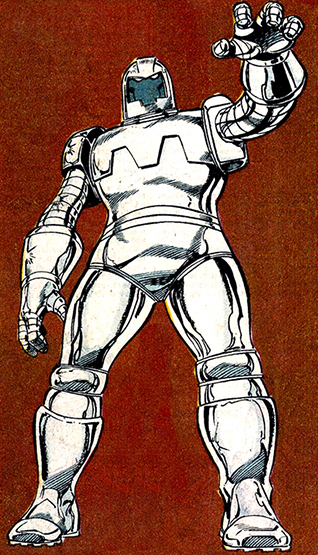 Powers/Abilities: Tess-One is a twenty foot tall assault robot designed in the early 1940s to seek out, identify and combat super-powered beings like Captain America. It possessed several offensive capabilities, such as force-beam projectors in its eyes and hands that fired concussive blasts, super human strength (able to lift 25 tons), combat programming, and boot thrusters for independent flight (sub-sonic, less than 760 miles per hour). After receiving its Adamantium coating (see comments) Tess became nearly impervious to damage, though its joints remained vulnerable. Tess-One may have other weapons systems as yet unrevealed. Doctor Doom used his mastery of robotics to enhance Tess' outdated micro processors, giving it limited sentience and interactive abilities. Doom also made Tess capable of absorbing any materials or energies required to fulfill its mission, enabling it to automatically repair any damaged parts or systems. (Captain America Annual#8 (fb) ) - Starting in 1939, the American military funded professor Erskine's Project: Rebirth, an operation designed to create super soldiers. However, they also wanted a failsafe in place should this new army of super men ever rebel against them. Professor Daniel Schumann spearheaded Project T.E.S.S., an acronym for Total Elimination Of Super Soldiers. He designed and built a prototype of a robot capable of dealing with super powered humans. However, both projects were discontinued when Erskine was murdered shortly after turning Steve Rogers into Captain America, taking the secrets of the super soldier serum to the grave. Schumann, however, took the Tess prototype home and finished the robot by himself. He never activated it though, instead leaving it inside a booby trapped basement. (Captain America Annual#8 (fb) - BTS) - Former SHIELD-agent Overrider learned of Tess' existence and used his mutant control over electronics to activate and summon the robot. (Captain America Annual#8) - Overrider's control of Tess momentarily slipped and the robot immediately reverted to its prime directive: destroying super powered beings. Its scanners located the mentally underdeveloped Nuklo (Bob Frank), who was wandering the woods near Westchester New York after getting into a fight at a bar Wolverine was present at. Thinking Nuklo might be a mutant, Wolverine followed him into the woods to talk, but arrived just in time to save the hapless manchild from getting killed by Tess. Wolverine attacked the robot, just as Overrider reasserted his control over Tess and they flew off together. Meanwhile, Captain America was investigating a mysterious hole in the parking lot of the Kwikkie Burgers at interstate I-94. It turned out to be professor Schumann's booby trapped lab. Intrigued, Cap began a search for some answers. Meanwhile, Overrider and Tess hijacked a truck heading for the Adametco Metallurgy company. Hiding Tess in the trailer, Overrider demanded the driver take them there. Adametco processed Adamantium and Overrider wanted to have Tess coated with the indestructible metal alloy. Both Wolverine and Captain America were on their trail; the former thanks to his superior tracking skills, the latter because of vigilant citizens calling the Captain America hotline about spotting a big robot. When the heroes arrived, Tess was in the middle of receiving the fourth of seven full body Adamantium coatings. However, as soon as its scanners picked up the heroes, its primary programming kicked in and it burst out of the Adamantium bath to attack Cap and Wolverine. Overrider managed to regain control and ordered Tess to retreat. The next day Overrider went to visit his son in a mental hospital. The boy was suffering from nuclear psychosis, a fear of nuclear war so great the child's mind had all but shut down. In order to cure his son, Overrider planned to use Tess-One to gain access to America's nuclear command center in Nebraska. With Tess keeping the security forces busy, Overrider would use his powers to launch America's entire nuclear arsenal into the sea, thereby ending the threat of nuclear annihilation forever. Wolverine and Captain America tracked them down and ultimately, since -- as the coatings weren't complete -- the joints weren't protected, Wolverine lodged his claws between Tess' head and neck, and Cap pounded them with his shield until they popped Tess' head off. (Avengers I#288 - BTS) - After its deactivation, Tess-One was moved to an air force base in Colorado. There, its head was reattached before it was put in storage. (Avengers I#287 (fb) - BTS) - The Super-Adaptoid plotted to gather other super-powered robots, apparently intending them to serve as a distraction for the Avengers while it replicated the powers of the sentient Cosmic Cube known as Kubik. (Avengers I#287 - BTS) - After enlisting Machine Man and Kree Sentry #459, the Super-Adaptoid targeted Tess-One. (Avengers I#288) - The Avengers learned the Super-Adaptoid's gathering other super powered robots. Doctor Druid and Black Knight took a Quinjet to the Colorado base where Tess-One was stored. Using his mental powers, Druid ordered the troops to hand over the robot to them. Seeing as military minds are conditioned to accept orders more easily, Druid's hypnotic suggestion was sufficient to get Tess-One out of storage and safely into the Quinjet's cargo hold. But on the way back to Hydrobase, they were intercepted by the Adaptoid and his robots who easily knocked both heroes out. Reactivated by the Adaptoid, Tess-One accompanied him and the other robots on their next mission: invading Avengers mansion on Hydrobase. Now calling the group Heavy Metal, the Adaptoid flew himself, Tess and the others to the artificial, floating island on the hijacked Quinjet. (Avengers I#289) -While the Super-Adaptoid went off on his own to locate and reactivate the Awesome Android, Tess-One joined the other members of Heavy Metal in creating a diversion by randomly levelling Hydrobase. This got the Avengers' attention, unfortunately only She-Hulk, Stingray, Namor and his wife Marrina were present to deal with the numerous threats. Machine Man fought Hydrobase resident Stingray, She-Hulk dealt with the Sentry and Namor and Marrina engaged Tess-One together. When the Awesome Android joined the fight and threatened to turn the tide of the battle in Heavy Metal's favor, Namor picked up the Android and continued the fight underwater where he yanked off the Android's head. This left Marrina free to help She-Hulk who was fighting a losing battle against Sentry 459. The Kree automaton almost drowned her, if not for Marrina's intervention. Tess-One had followed Marrina into the water however, ready to kill. This actually proved to be the robot's undoing: the two heroines managed to push Tess off the edge of Hydrobase and watched as it helplessly sank to the bottom of the ocean. (Avengers I#290 - BTS) - Tess-One was mentioned as one of the members of Heavy Metal responsible for the destruction to Hydrobase, while under the Super Adaptoid's command. (Captain America I#354 - BTS) - In the aftermath of their fight against Heavy Metal, the Avengers collected the remains of their robotic foes and placed them in stasis for study in Hydrobase's hangar 3. (Captain America I#354) - Tess-One was seen along with the other members of Metal, all decapitated and under a stasis field, when Captain America visited hangar 3 to deliver the fourth Sleeper robot for safekeeping. (Avengers I#311- BTS) - In the opening gambit of the Acts of Vengeance, an army of Dr. Doom's elite cadre of killer robots attacked Hydrobase and destroyed the giant cushions that kept the island afloat. Hydrobase sank to the bottom of the ocean. And as the power went down all over the island, the stasis fields holding Tess-One and the other members of Heavy Metal gave out as well. 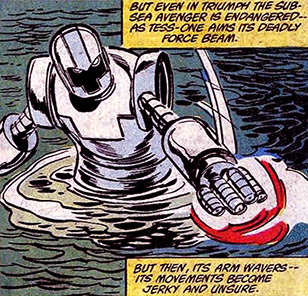 (Avengers Spotlight#29 - BTS) - After completing an underwater survey of the wrecked Hydrobase, Stingray confirmed the disappearance of Tess-One, the Super-Adaptoid and Sentry 459. Before he could go look for them, Stingray was attacked by the Awesome Android. The Android was eventually defeated by Avengers reservists Moondragon, Firebird, Black Widow, Captain Marvel (Monica Rambeau) and Tigra who managed to get the stasis field generator back online. (Spectacular Spider-Man II#160 (fb) - BTS) - After the destruction of Hydrobase, Tess-One once again was stranded on the ocean floor for some time. (Spectacular Spider-Man II#160 (fb) - BTS) - In his ongoing attempts to understand Spider-Man's new cosmic powers (unbeknownst to all, he had been powered by the cosmic Uni-Power, which often manifests in the form of Captain Universe), Doctor Doom retrieved Tess-One from the bottom of the ocean. 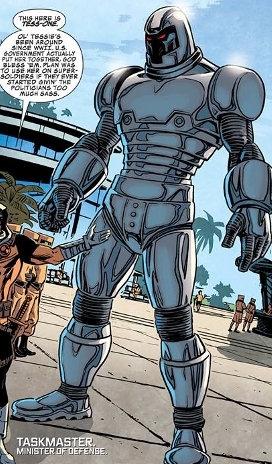 Doom's robots upgraded Tess' WWII era microprocessors, granting the robot limited sentience and the ability to speak and follow verbal commands. Doom also gave it the power to analyze and incorporate any material or form of energy so it could reconstruct itself. During the events known as the Acts of Vengeance, Doom planned to have Tess assimilate whatever was powering Spider-Man, so he could harness those energies for himself. (Spectacular Spider-Man II#160) - Doom's Acts of Vengeance "allies" the Kingpin (Wilson Fisk) and Loki (his identity at the time unknown to his pawns) entered Doom's laboratory as his robots completed work on Tess. 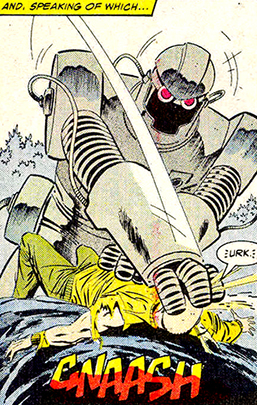 Doom convinced Tess-One that the wallcrawler was indeed one of the super soldiers it was designed to eliminate, and Tess fought Spider-Man who eventually blasted the robot to bits (see comments) with a beam of cosmic force. After the battle, Doctor Doom had Tess-One's remains recovered and rejoiced that his plan had worked: Tess had indeed collected a small part of Spider-Man's cosmic force, though probably not enough to rebuild itself. 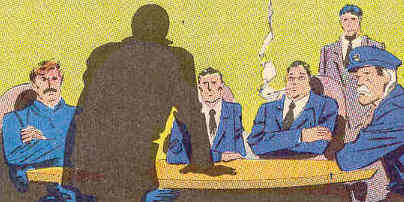 (Web Of Spider-Man I#61) - Tess-One's head was seen in Doctor Doom's lab, as Doom analyzed the data it had collected on Spider-Man's cosmic energy powers. (Secret Avengers II#8 (fb) - BTS) - Through unrevealed circumstances, Tess-One was either rebuilt or able to rebuild itself. 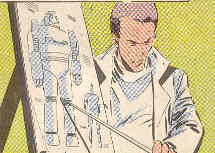 AIM may have participated in the reconstruction or simply obtained Tess-One at some point, and Tess was placed under the guidance of Taskmaster in training new agents. (Secret Avengers II#8) - Tess-One was seen on A.I.M. Island, training the Taskmaster's cadets. The villainous drill sergeant complimented Tess on being a tough old gal, able of shooting a hell of a good plasma beam. Tess proceeded to teach two rather unlucky volunteers some basic combat tactics and ended up beheading one of them, and Taskmaster announced he needed another volunteer. Comments: Created by Mark Gruenwald, Mike Zeck and John Beatty. Interestingly, Overrider refered to Tess as a she. But the robot never showed any sign it considered itself of any particular gender, even after achieving, albeit limited, sentience. He probably called her 'she' because Tess is also a girl's name. Taskmaster referred to Tess in the female form as well. The name of the program during which it was built was TESS, but the robot itself is generally referred to as Tess-One. Adamantium is typically indestructible short of molecular rearrangement and/or magic, and generally when we see something blown apart that is allegedly made of Adamantium, I often suspect it is actually Secondary Adamantium. In this case, since we know Tess-One was indeed coated with Adamantium (though only 4 of 7 treatments), I'd think that perhaps Spider-Man sub-consciously used the Uni-Power to molecularly rearrange the Adamantium in Tess-One, facilitating its destruction. Or, perhaps the 4 coats did not allow a complete coating of Adamantium...or some weak points had been etched in it by Wolverine's claws and Captain America's even more indestructible shield. The Captain America: America's Avenger handbook noted his coating to be "more likely secondary Adamantium." (Captain America Annual#8 (fb)) - During World War II, US President Franklin Delano Roosevelt had a secret meeting with the war department's top brass and scientists shortly after they began Professor Abraham Erskine's Project: Rebirth, an operation designed to create super soldiers. (Captain America Annual#8 (fb) / Official Handbook of the Marvel Universe '89 Update#7: Tess-One entry) - Professor Schumann argued, however, that once America had its army of super-soldiers and they won the war and came home, what would prevent them from abusing their superior power, becoming a threat greater than what they had been created to combat, perhaps even becoming the master race that Adolf Hitler glorified. His answer was a failsafe force of robots capable of neutralizing hostile super-soldiers. (Captain America Annual#8 (fb)) - On February 2, 1939, Schumann was given the go ahead on Project T.E.S.S., an acronym for Total Elimination Of Super Soldiers. (Captain America Annual#8 (fb) / Official Handbook of the Marvel Universe '89 Update#7: Tess-One entry) - Schumann designed and built a prototype robot, Tess-One. However, both projects were discontinued when Erskine was murdered shortly after turning Steve Rogers into Captain America, taking the secrets of the Super-Soldier serum to the grave; Project TESS was terminated and Schumann's funding cut off September 14, 1940. (Captain America Annual#8 (fb) / Official Handbook of the Marvel Universe '89 Update#7: Tess-One entry) - Unable to give up on his work, Schumann took the incomplete Tess-One home and, over an unspecified number of years, finished the robot by himself in a workshop he had constructed in his own basement. He never activated it though, instead leaving it inside a booby trapped basement. (Captain America: America's Avenger (fb) - BTS) - Schumann apparently passed away.